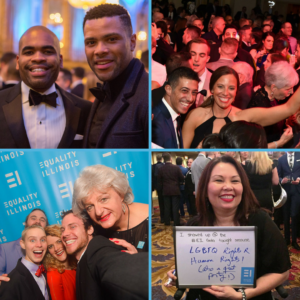 Equality Illinois welcomed a full house of nearly 1,500 supporters of LGBTQ civil rights on Feb. 2, 2019 for the 2019 Equality Illinois Gala in the Hilton Chicago. The evening was exciting, fun, informative, and inspiring, as people came together to hear about the successes and ongoing challenges of building a stronger Illinois in the face of national headwinds against LGBTQ civil rights. And folks attending the Midwest’s largest LGBTQ soirée also had a great time! In these video and photo galleries, relive those moments. Many pictures can be purchased as keepsakes. Honorees at the event included Illinois AFL-CIO, Breakthru Beverage Group Vice Chairman Danny Wirtz; and Channyn Lynn Parker, a longtime activist who is Howard Brown Health’s newly-appointed manager of external relations. Our plan for 2017-2022 and beyond. Equality Illinois CEO spoke about becoming a father and the legacy of activism and hard work that have resulted in greater equality for the LGBTQ community. Mayor Buttigieg spoke about the long road he took to finally reach the difficult decision he made to come out publicly in 2015. His military service in Afghanistan; as well as being married to husband Chasten Glezman. Governor J.B Pritzker joined onstage by his wife M.K., Pritzker spoke about his longtime support of LGBTQ rights as well as the Equality Illinois organization. The Chicago mayor opens the 2019 Equality Illinois Gala. Honorees at the event included Illinois AFL-CIO, Danny Wirtz; and Channyn Lynn Parker. Relive the experience of the exciting 2018 Gala.